What is the best cream for wrinkles? Every woman on this Earth has wondered about what is the best cream for wrinkles. Has she managed to find it? Some accepted botox in their lives. But others, discovered another solution: bee venom products. Though you all probably know that bee venom is successfully used in a wide range of conditions like osteoarthritis, multiple sclerosis, parkinson, myopathy, polyneuritis, dementia, hypertension, arteriosclerosis, aeehytmia, asthma, cancer and so many other, bee venom is also successfully used in cosmetics. Bee venom has been said to be the new botox. It certainly is not that painful. And no, we don’t take the bee and make it sting us in the face. There are non-invasive methods to collect the venom. Cosmetically, bee venom is used to “fool” the skin and makes it think is was lightly stung with toxin melittin. This causes the body to direct blood towards that era and stimulate the production of the naturally-occuring chemicals collagen and elastin. Collagen strengthens the tissues of the body, while elastin is the protein that helps the skin remain taut and bounce back into shape after being pressed or pinched. (according to Stefan Bogdanov, Webmaster and Coordinator of the International Honey Commission). 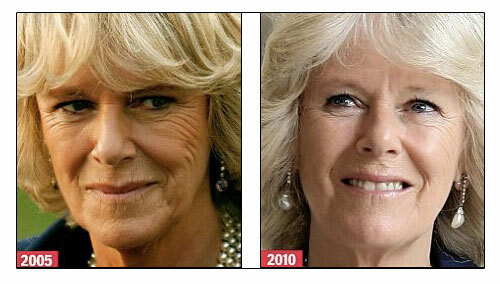 One of the supporters of this idea is Camila Parker-Bowles, Duchess of Cornwall and wife of Prince Charles. Take a look of her transformation! And lots of other celebrities, who decided not to go on surgery or injections, and chose natural products to make their complexion looks rejuvenated. And then, tons of other women, who followed their example, or simply trusted the science behind the product, and refused to use botox. Looking good is a matter of self respect, and a woman doesn’t need to be famous to want to feel beautiful and happy. Deborah Mitchell, founder of this brand, personally gave the Duchess of Cambridge a Bee Venom facial at Clarence House a few days before the big wedding and she even treated Camilla Parker Bowles on the morning of the ceremony itself. Heaven is a luxurious range of anti-ageing, all-natural skincare containing organic ingredients, which have been developed for a radiant, flawless complexion and to help heal skin conditions, from blemishes to eczema. Their lines of products contain all possible things necessary for a perfect complexion, but also for the whole body. Their best sold product is the mask, Heaven Skincare Bee Venom Mask, which on Amazon is $182.00 for a jar of 1.7 fl oz. But you can best get their products from their site: heavenskincare.com. A company based in London, also offers natural alternatives to injectables & plastic surgery procedures, delivering targeted treatments to specific skin concerns, combining the best of anti-ageing and firming ingredients. In 2005, Rodial was invited to be an official goodie bag partner for The Oscars after party, where a number of A-List celebrities received products such as Tummy Tuck, Glam Balm & Brazilian Tan. Since then, Rodial products have fast become a beauty product staple makeup artist’s use, helping Hollywood’s leading ladies achieve their red-carpet flawless look. Rodial Bee Venom 24 Carat Gold Body Soufflé It’s $175.00 on Amazon . This is a decadently whipped soufflé concentrate with pure liquid gold, which indulges the skin in luxurious moisture. Double-strength bee venom combines with Hyaluronic acid to help plump and firm appearance of the skin whilst the body is left instantly soft to the touch with the moisturizing power of shea butter. A review on Amazon says: “I will never try anything else again!” Pretty convincing, right? BEE VENOM 24 CARAT GOLD SUPER ESSENCE £375 for only 30 ml, on the producer’s site. It contains: bee venom, cyclopeptide-5 and AauraSphere N, this helps to plump and smooth appearance of wrinkle depth and blurs fine lines. Despite the cost, it had a tremendous success. On their page we can find Bee Venom Facial Serum, Bee Venom Repair & Protect which contains Bee Venom + Allantoin, Bee Venom Facial Oil, and many other amazing products. 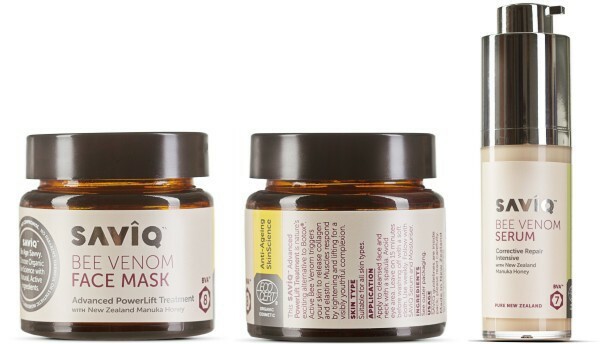 Their products contain: Bee Venom that increases blood circulation, and the movement of nutrients between the levels of the skin, Manuka Honey, to nourish and moisturise the skin, Alpine Rose Stem Cells that help prevent the loss of collagen within the skin, and the damage to the tissue, increasing the vitality of stem cells in the skin. They also have Almond and Bassabue oils which are considered vital ingredients that have a huge range of benefits and are rich in linoleic acids, and vitamins A, D and E. Linoleic Acid, or vitamin F, is an essential fatty acid vital for regeneration and moisturisation of the skin, and is a powerful anti-inflammatory. 100% of women said their skin felt rejuvenated after using Bee Venom Facial Serum. 100% of women rated this product either good or excellent. 99% of women stated that their complexion improved after using the Bee Venom facial serum. 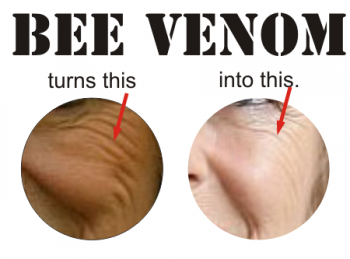 99% of women would replace their current anti-ageing product with the Bee Venom Facial Serum. 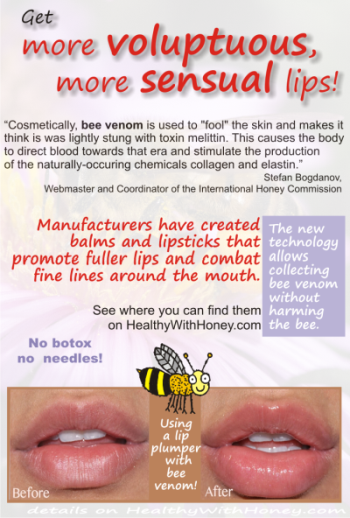 98% of women could feel the Bee Venom Facial Serum working from the instant they applied it. Abeeco, a company based in New Zealand. Offers masks, creams, lip plumpers, eye cremes, which are less expensive, yet with not so astonishing reviews. Just to give an example of their products: Abeeco Pure New Zealand Bee Venom Mask at $54.99 on Amazon. It contains: New Zealand Bee Venom, New Zealand Manuka Honey, Shea Butter, Jojoba Seed Oil, Cocoa Butter, Lavender Oil, Vitamin C, Vitamin E.
Other producers: Saviq, Nature’s Beauty, Saintsco, AbsorbHealth, DuWop, RIZ Bee Venom, WEI and many more. There are also a lot of products that plump your lips, make them look more voluptuous and sensual. Here are some amazing products. They will give you a tingling sensation after applying it, but so many girls have said it was worth feeling it. So, yes, there are many producers on the market. The most expensive ones are not just being greedy, their products managed to reach the most demanding requests. Are the bees killed to get their venom? Absolutely not. The method of taking their venom is not invasive at all, is all about tricking them a little. At the entrance of the hive, a glass pane is put, and a very gentle electrical current runs through it. The bees feel it and because they perceive it as a threat, will try to sting it. Only that the surface of the glass cannot be penetrated so the venom remains on its surface, and the stinger also remains in the bee’s abdomen. The bee is alive and we get the venom. Do not use if you are allergic to bee stings or bee products. The products come with a patch test, so if you don’t know if you are allergic to them, you can give it a try first. Pictures licensed under Creative Commons Attribution-Share Alike 3.0 via Wikimedia Commons: Kate Middleton by Nick Warner, Michelle Pfeiffer by Towpilot; “Dannii Minogue” by Acediscovery; Victoria Beckham by LGEPR; Gwyneth Paltrow by Georges Biard. I love your site. I’m very into natural remedies and beauty products and this article was so fascinating. I wonder who (and how) they originally figured out bee venom was so useful for wrinkles! Bee venom, just like honey, was used since Egyptians, as far back as we can trace history. And I suppose using it for wrinkles was not that hard to figure out, because a stung leads to a swell, so, in controlled quantities, is will “swell” the skin a little and make the wrinkles disappear. The scientific approach says that the toxin melittin causes the body to direct blood towards that era and stimulate the production of the naturally-occuring chemicals collagen and elastin. Hi. I love your website and I’m particularly interested in this article on cream for wrinkles. I’m working on a site to help men take better care of themselves (tidyface.com) and I will be checking out products that might suit the male skin, so the bee venom thing intrigues me. I have bookmarked you and will return! It’s a wonderful idea. A man’s skin is really important to a woman as well, despite people believing something else! Simon Cowell is using bee venom products, from the Heaven range, and he doesn’t look his age at all, I would say. So, yes, you have a great idea, make it happen! Thanks Laura, I’m going to get on the case! I have to say I did not know there were so many applications for honey and apparently bee venom! I am looking forward to exploring this sight! Hi Jared. We use everything from a bee. Even the bee’s body, making another great product ‘Apilarnil“, which is really good for a lot of conditions. Honey is the only food that contains everything needed to sustain life. Somehow, bees seem to have been created for us, humans. So, we should all say a big THANK YOU to the bees and their Creator! Very interesting article, I’m lucky I don’t need to worry about wrinkles, not yet anyway.